In today's economy, countless unemployed professionals are becoming entrepreneurs out of necessity. They may have good skills and ideas, but do they really understand what it takes to build a profitable venture. Susan Solovic shows prospective entrepreneurs how to sidestep the pitfalls that doom more than half of all new businesses while dramatically improving their odds of success. Many people launch themselves into the wild adventure of starting a new business without first asking themselves a key question: Do they want to start a business? It seems a simple enough question to answer, but the truth is far more revealing. As a small-business consultant, serial entrepreneur and owner of the video news site itsyourbiz.com, Susan Wilson Solovic is often approached by people who have lost their jobs and are seeking advice on starting a new business. "It doesn't take long for me to identify the ones who are only going through the motions," she writes in her new book, It's Your Biz. "They don't have the sparkle in their eyes when they talk about their business idea." Some even ask if she knows of any leads to any jobs — something that someone passionate about starting their own business would never do. And if you're not passionate about starting a business, don't try, Solovic tells her readers. If you're starting a business because you want to leave a job you hate, or because you're unemployed and need some money, you're starting a business for the wrong reasons and are most likely to fail. As Solovic explains, starting a business requires such a large personal and financial commitment, not to mention unlimited amounts of energy and focus, that only the most dedicated and motivated entrepreneurs can succeed. And even if you're motivated, you might still fail if you don't have the right attributes for starting a business. Solovic offers an entrepreneurial personality assessment ("I am a self-starter," "I am a high-energy person," "I have a strong personal support network," "I am comfortable making decisions," etc.) to help readers determine whether they have the right characteristics for entrepreneurship. Readers who pass the gauntlet of Solovic's first chapter and are definitely willing to start a business will want to read this book from cover to cover. Solovic and her co-author, Ellen Kadin, have crafted a clear, succinct and yet comprehensive how-to manual on launching a business. Part I introduces the reader to the reality of entrepreneurship. For example, on the financial side, prospective entrepreneurs are urged to ask themselves: How much money can I afford to lose? How long can I go without an income from my business? How will I recover if the business fails? This is a very critical question when one considers the number of startup companies that don't survive a year of operation. Additional chapters in this section cover different options for starting a business, including starting part time while keeping your "day" job and franchising; how to carefully choose the right business area and industry to enter; and what should be included in your business plan. Part two of the book covers the nuts and bolts of running and growing a startup. Chapter topics range from financing, marketing and people issues to intellectual property, location and pricing. In the chapter on people, for example, Solovic and Kadin urge entrepreneurs to hire people based on the concept of MYTOP (Multiply Yourself Through Other People). The first step is for entrepreneurs to assess their strengths and weaknesses in a long list of business functions (a worksheet is provided). Entrepreneurs should then try to find employees who are strongest in the entrepreneur's weakest areas. Articulating expectations, determining salary range and hiring people who are smarter than you are the other basic steps in finding the first employees of a startup. Other checklists in the chapter include how to determine the correct status of an employee (the wrong status will cause problems with the IRS) and how to prepare and conduct an effective candidate interview. Solovic and Kadin effectively convey the promise and the peril of launching your own business. As the authors write, what you don't know about running a business can and will hurt you. 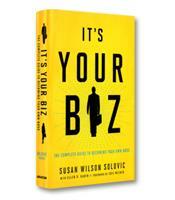 It's Your Biz: The Complete Guide to Becoming Your Own Boss is highly recommended to all those pondering the leap.